We offer a limited selection of chrome-tanned, unborn, or prematurely born calf skins, often called either slink skins or slunk skins. The hide side is soft and supple. See below for our notes on sizes and uses. Our website is updated most days, so the information below is generally up to date. 1) Small (early stage fetus with very, very short hair) - We do not usually stock these as they are very small--only one or two square feet. We can get some on a custom-order basis, but please allow up to two months. 2) Medium (medium stage fetus with very short hair) - These are usually in stock. The medium skins have very short hair (about 1/4") and almost appear to be sheared. The skin is very fine and soft. The vast majority are solid black, but we do get a limited number of black and white or brown and white skins. The skins average only 2-3.5 square feet. 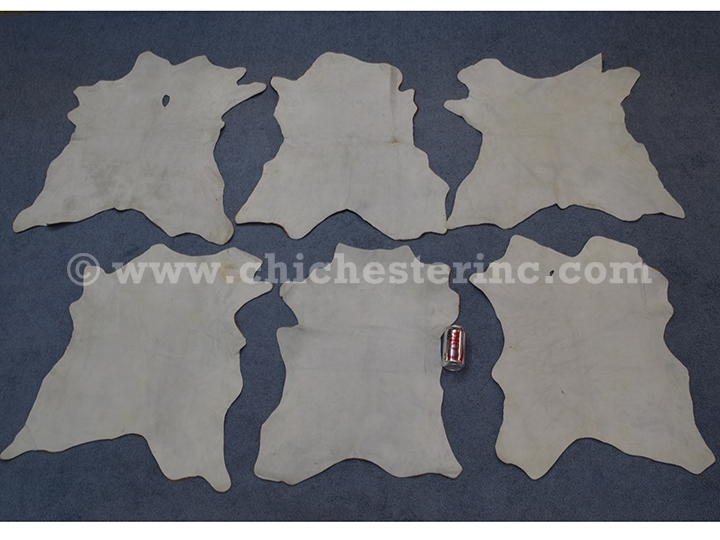 We also have medium B grade unborn calf skins. These skins may have some holes and scratches. They come in a mix of colors and measure about 4 to 5 sq. ft. The hair length on B grade calf skins is very short; less than ½” long. 3) Large (late stage unborn calves with longer hair, up to 3/4"). The skins average about 5 to 6 square feet. The large skins in the gallery (G160 to G166) were handpicked in Buenos Aires and are some of the most interesting unborn calf skins we have ever seen. The hair is incredibly thin and short on these skins. Our Gxx codes denote individual pieces. If you would like to order a specific calf slink, please go to our Gallery to pick the exact one shown. There are no export controls from CITES or USFWS. The skins are an accident of nature. The calves were not killed just for their skins. To clean your calf skin, first use a brush in the direction of the hair (not against the knap) to remove loose dirt. Then wet the skin with a damp cloth. Apply a very small amount of shampoo and rub with the hair. Brush gently with the hair. Wipe with clean water until the soap suds are gone. When it dries, the skin will be hard. Rub and stretch the hide with your hands to soften it again. See our wool and fur cleaner called Eucalan for the perfect cleaner. Click HERE to go to that page. 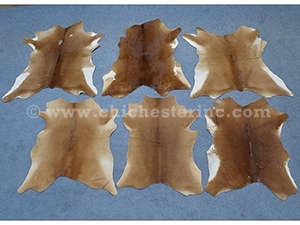 We can also supply slink skins in rawhide for parchment and vellum. Please see our Rawhide listings for more information.